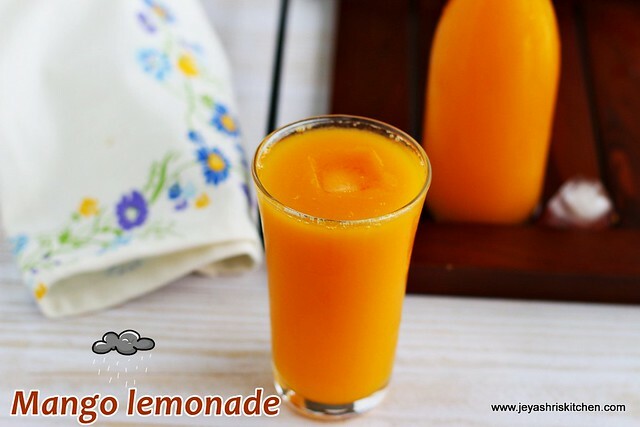 Mango lemonade is a popular mango based juice made using fresh mango pulp and lemon juice. When i tried Grape juice few years back i added a small piece of ginger to this. That was a super hit at home. So i wanted to try the same with mango lemonade too. Generally for lemonade they make simple syrup, that is sugar syrup, but i wanted to make it simple so just added sugar as we do for other juices. Enjoy summer with mangoes. As mangoes are peak in season now, i will be posting a mango recipe every week. All mango lovers stay tuned. Peel the skin of the alphonso mango and take out the pulp. It came out 3/4 cup of mango pulp. Grind the mango, ginger and sugar into a fine paste. Add little water while grinding. After grinding transfer it to a wide bowl. Add 3 cups of water and few ice cubes. Sieve it to get rid of the fibre from the ginger or mango if any. 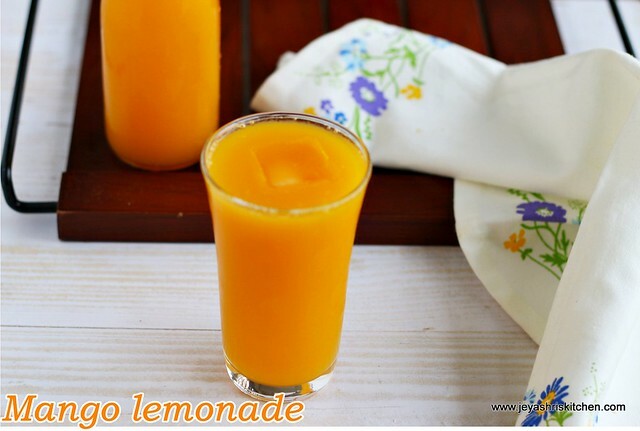 Instead of lemon juice you can add 1/2 cup of orange juice too. If you do not want ginger skip it, but i highly recommend ginger as it was so refreshing. You can replace sugar with honey. You can garnish with few mint leaves for an additional flavour too. I used alphonso mangoes for the mango lemonade, you use any variety of rip mango available in your place.